Diva Eyelash Extensions has gradually becoming a popular new trend where lightweight, synthetic lashes are expertly attached onto your natural lashes which enhance the length, thickness, volume and curl of the look of your lashes. With Diva eyelash extensions technology, anyone can posses those long, luscious eyelashes everyday without the need for mascara. They are semi-permanent with different designs and styles to suit every occasion. May it be for that special date, school balls, wedding, or simply the love to have those long fabulous celebrity lashes. You can choose to look as natural or glamorous as you wish. 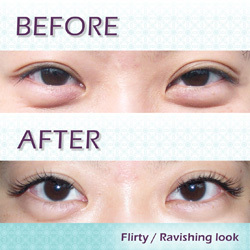 With proper care, these semi-permanent Diva eyelash extensions can last up to 3-6 weeks. And with regular infill or retouching, it could last pretty much indefinitely. Then Eyelash Extensions is perfect for you!